Smakwater and Sprezzatura Awards and Titles | Champion Labrador Retrievers Field, Hunting, Conformation, Show, Obedience, Therapy, Stevensville Mt. 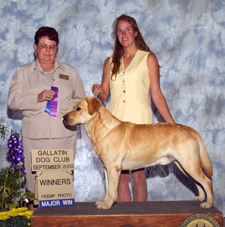 With over 500 awards and titles combined from events in the field, conformation ring, obedience ring, therapy work, and through ethics and perseverance by the grace of God, Smakwater and Sprezzatura has earned 6 Championships including National and International titles, 20 Best in Show, 44 Best of Breed, 155 1st Place wins, 83 Field, 27 Obedience, and has certified 3 Delta Society canine therapy dogs. In addition, INT CH, CH Ransom’s R Sprezzatura Stash SH, CD, CGC, AAT, AAA earned an invitation to represent the Labrador Retriever breed at the American Kennel Club’s Westminster Event in 2005, and was the most accomplished Labrador to attend. Since 1994, our Labradors have been featured in books, on cards, in calendars, and on websites by publishers including Gun Dog Magazine, Retriever Journal, Willow Creek Press, Brown Trout Publishers, Voyageur Press, Leap Frog Publishers, and Today’s Breeder. Feature artists include Dale Spartas, Alan and Sandy Carey, Cindy Wise, Denver Bryan and John Eriksson. 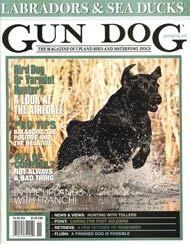 Smakwater’s Dark Side “Shade” graced the cover of Gun Dog Magazine on the October – November 2007 issue with a water entry photo taken by John Eriksson, (photo titled “Lemme at ‘em! Produced by Denver Bryan/Images on the Wildside). Although it is rewarding and fun to see our efforts portrayed by photographs, ribbons, and certificates, we have never felt that the end justifies the means, nor does affirmation by organization always represent an accomplishment entirely or accurately. We have however, always believed that win or loose, the path that you choose is what validates your conscience. A friend and mentor Ron Craven once told us, “If you take the joy out of the dog or the work, you’ve defeated the purpose”. We hope that you agree, and find joy in the gift that comes from befriending these wonderful animals.